A bitmap is an array of bits that specifies the color of each pixel in a rectangular array of pixels. The number of bits devoted to an individual pixel determines the number of colors that can be assigned to that pixel. For example, if each pixel is represented by 4 bits, then a given pixel can be assigned one of 16 different colors (2^4 = 16). 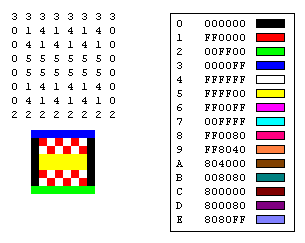 The following table shows a few examples of the number of colors that can be assigned to a pixel represented by a given number of bits. Disk files that store bitmaps usually contain one or more information blocks that store information such as number of bits per pixel, number of pixels in each row, and number of rows in the array. Such a file might also contain a color table (sometimes called a color palette). A color table maps numbers in the bitmap to specific colors. The following illustration shows an enlarged image along with its bitmap and color table. Each pixel is represented by a 4-bit number, so there are 2^4 = 16 colors in the color table. Each color in the table is represented by a 24-bit number: 8 bits for red, 8 bits for green, and 8 bits for blue. The numbers are shown in hexadecimal (base 16) form: A = 10, B = 11, C = 12, D = 13, E = 14, F = 15. Look at the pixel in row 3, column 5 of the image. The corresponding number in the bitmap is 1. The color table tells us that 1 represents the color red, so the pixel is red. All the entries in the top row of the bitmap are 3. The color table tells us that 3 represents blue, so all the pixels in the top row of the image are blue. There are many standard formats for saving bitmaps in files. Windows GDI+ supports the graphics file formats described in the following paragraphs. BMP is a standard format used by Windows to store device-independent and application-independent images. The number of bits per pixel (1, 4, 8, 15, 24, 32, or 64) for a given BMP file is specified in a file header. BMP files with 24 bits per pixel are common. JPEG is a compression scheme that works well for natural scenes, such as scanned photographs. Some information is lost in the compression process, but often the loss is imperceptible to the human eye. Color JPEG images store 24 bits per pixel, so they are capable of displaying more than 16 million colors. There is also a grayscale JPEG format that stores 8 bits per pixel. JPEGs do not support transparency or animation. JPEG compression does not work well for line drawings, blocks of solid color, and sharp boundaries. The following illustration shows a BMP along with two JPEGs and a GIF. The JPEGs and the GIF were compressed from the BMP. The compression ratio is 4:1 for the GIF, 4:1 for the smaller JPEG, and 8:3 for the larger JPEG. Note that the GIF maintains the sharp boundaries along the lines, but the JPEGs tends to blur the boundaries. The PNG format retains many of the advantages of the GIF format but also provides capabilities beyond those of GIF. Like GIF files, PNG files are compressed with no loss of information. PNG files can store colors with 8, 24, or 48 bits per pixel and gray scales with 1, 2, 4, 8, or 16 bits per pixel. In contrast, GIF files can use only 1, 2, 4, or 8 bits per pixel. A PNG file can also store an alpha value for each pixel, which specifies the degree to which the color of that pixel is blended with the background color. PNG improves on GIF in its ability to progressively display an image; that is, to display better and better approximations of the image as it arrives over a network connection. PNG files can contain gamma correction and color correction information so that the images can be accurately rendered on a variety of display devices.